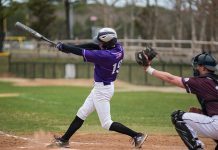 Martha’s Vineyard came oh so close to a history making win Friday night in the Eastern Athletic Conference opener at Dan McCarthy Field in Oak Bluffs. Winless in four previous EAC games against league power Bishop Feehan, the Vineyarders fought the Shamrocks to a 0-0 tie in regulation, traded touchdowns in the first overtime and lost on a 20-yard field goal in the third overtime, 9-6. The Vineyard defense, for the second week in a row, was superb, giving everything asked of it and then some. 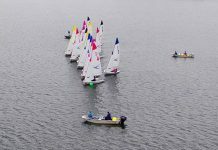 Offensively, the Purple had their chances but couldn’t put the necessary points on the board, though Isaac Higgins broke free for some fine runs up the gut. With 2:30 left in the fourth quarter and the score tied at 0-0, Feehan fumbled James Sashin’s booming punt and the Vineyard’s Austin Chandler recovered at the Shamrocks 14 yard line. The Vineyarders got a first down and had a first and goal at the Shamrocks three yard line but failed to punch the ball in on three attempts. Kyle Stobie came on to attempt a short field goal with 10 seconds left. The kick was wide left and the teams went to overtime. Each team got the ball at the 10 yard line. The Vineyarders went for the end zone first and scored the first points of the game. Mike Mussell fired a seven-yard touchdown pass to Joe Turney and the Vineyarders led 6-0. The conversion was no good. The Shamrocks tied the game at 6-6 on their first play, an Isaiah Douglas 10 yard sweep to the left corner. The Purple snuffed the two point attempt and went back on defense to start the second OT series. The tenacious Vineyard D pushed Feehan back to the 24 on successive plays. A third down pass was incomplete. Feehan’s Brendan Mulligan tried a 40 yard field goal and missed narrowly left. The Vineyarders now had a chance for the walk off points but the second overtime ended with an interception on third and goal from the seven. The Purple started the third extra series on offense but went four and out on a run and three incompletions. 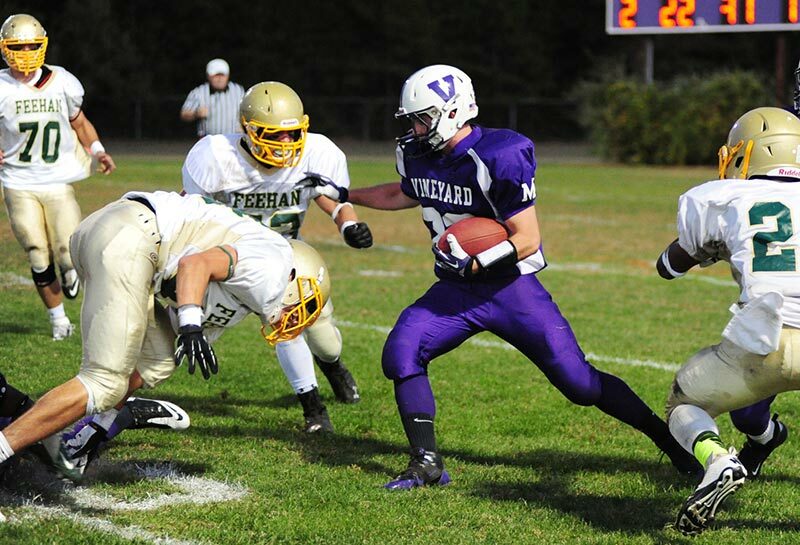 The Vineyarders then held Feehan to seven yards in three plays, setting up the third Shamrock field goal attempt of the game. This time, Mulligan made no mistake, splitting the uprights and breaking Vineyard hearts. Following the emotional loss, a solemn Vineyard team huddled at midfield. The coach was frustrated by his team’s efforts to score in close. Conversely, Coach Herman was mighty impressed by a defense that has rebounded from allowing 60 points to Brighton just two weeks ago by holding Randolph to 94 total yards last week and blanking Bishop Feehan through 44 minutes of regulation play. “I couldn’t have asked for anything more out of our defense,” he said. “They did everything we needed them to do. It’s a big improvement from the Brighton game.” Andrew Jacobs-Walsh had 12 tackles and a fumble recovery. Tony Canha had 11 tackles. The Vineyarders (1-3 overall and 0-1 EAC) will now try to regroup and focus on next Friday’s league matchup with Bishop Stang in North Dartmouth. The Vineyarders have a bye week October 11, play at Somerset Berkley on October 19 and return to Dan McCarthy Field on October 25 for the EAC finale against Coyle Cassidy.